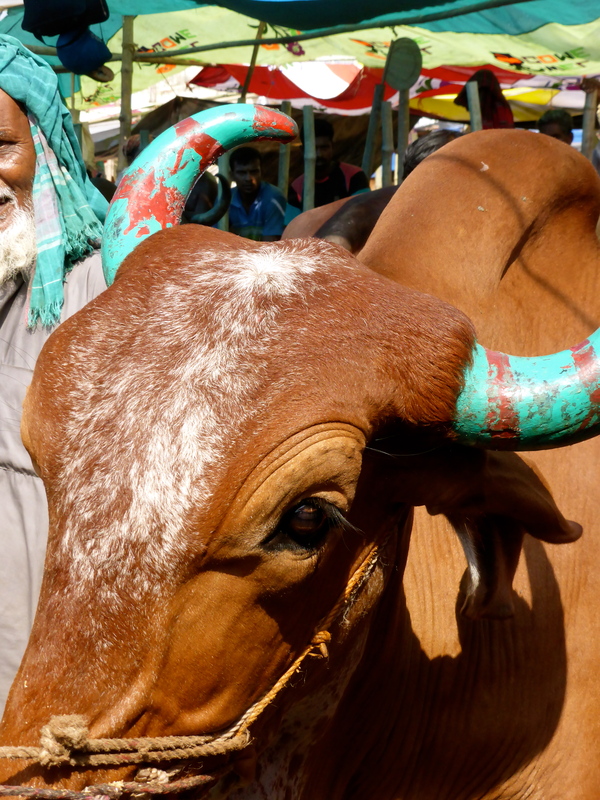 As Eid-ul-Adha (a celebration commemorating Abraham’s willingness to sacrifice his son) approaches, many Muslims will buy a “cow” to sacrifice. Although folks say “cow,” the cattle for sale are actually bulls. 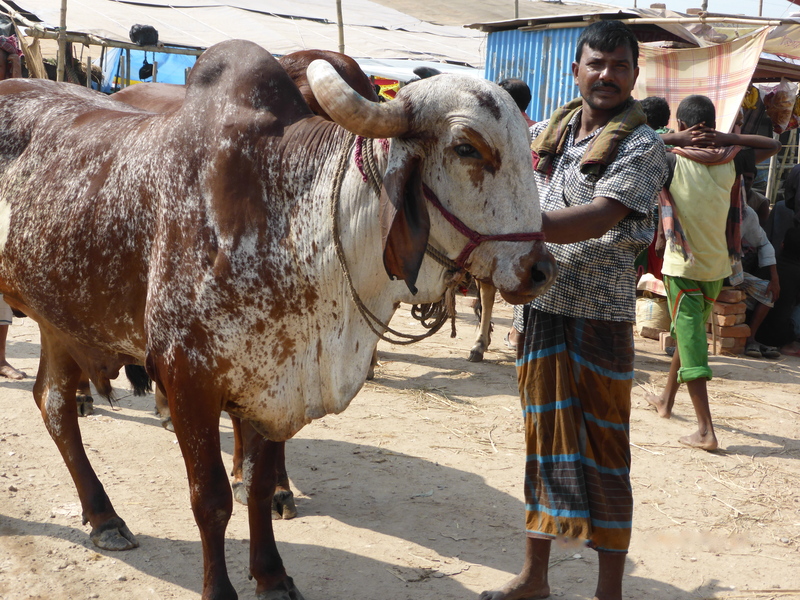 The largest “cow market” in Dhaka is the Gabtoli cattle fair, located on the road to Savar, next to the Gabtoli bus terminal. I was told to take “gum boots” because of the cow “mud” on the ground. One person even told me to take a rain jacket as protection against the “mud” on the cows which might rub against me. It had not rained recently, so when I got to the cattle market, I chose not to wear my rubber boots (and I did not take a rain jacket anyway). It was extremely dusty and crowded. A bull with painted horns. I did not find the cattle market smelly. The smell of the open sewers in my neighborhood is much worse. The bulls were extremely clean and well cared for. I saw them being washed using hay as a sponge. The bulls were docile and they were not castrated. There was indeed some manure on the ground but I walked around it, and I do not think that I would have walked in it even if I had been wearing my gum boots. 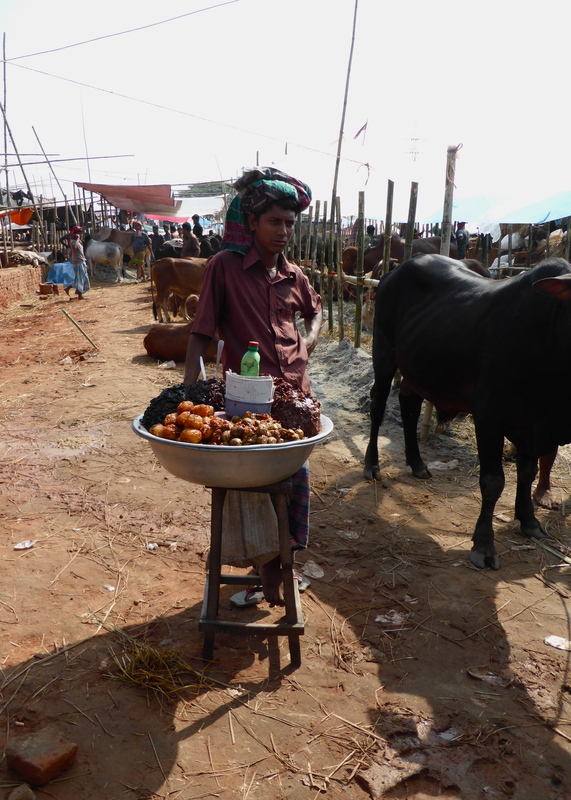 Snack vendor at Gabtoli cattle market. The cattle pens were row upon row of bamboo stakes and fabric sun awnings. Like a county fair, there were vendors selling snacks and some selling feed for the cattle. The cattle were fed grain mixed with water. I cannot remember how much a bull cost per kilo but I think that when we asked about a certain bull, the price was around 70 lakh taka (a lakh is 100 thousand) so around $900. For those who can’t afford a bull, a goat will suffice, but I didn’t see any for sale at this market. I was also told that camels and water buffalo might be for sale at the Gabtoli market. I didn’t see any but instead saw many different breeds of cattle including miniature breeds, Rajastani (with hump), Hereford, Jersey mix — and all in a variety of colors from all white, dun, to all black. 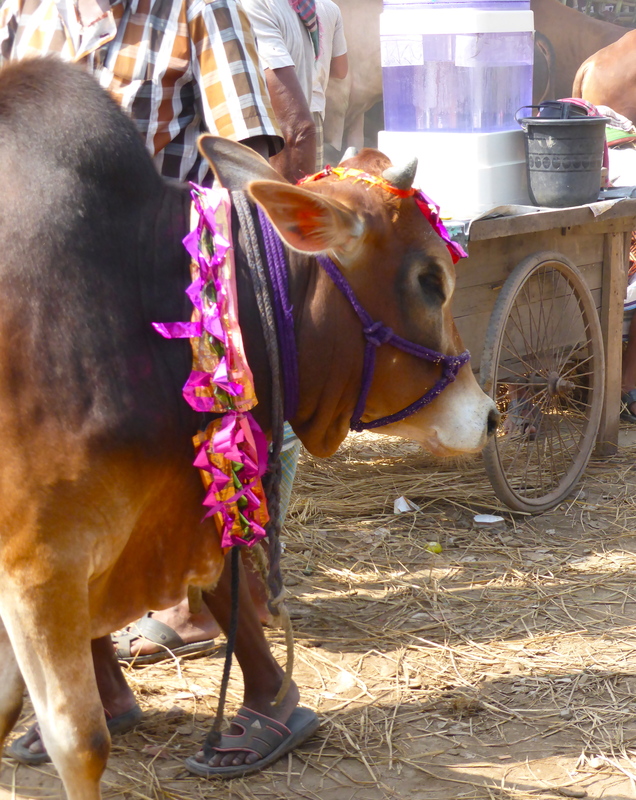 The bulls get decorated for Eid-ul-Adha. 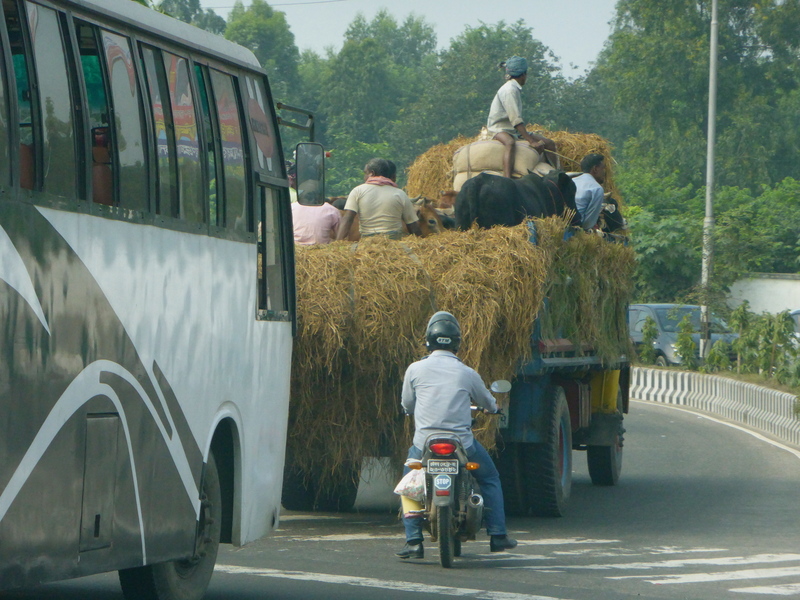 Bull on the road to the cattle market. All in all, it was interesting to see the cattle market after all stories I was told. It was much like a cattle fair in the U.S. except that here we expats drew a crowd. More on that in another blog posting.